There is a large Balcony overlooking the Garden Area which is ideal for outside dining or just relaxation. There is a traditional Stone Barbecue in the Garden near to the large Swimming Pool. The Garden is well maintained after and is very private. There is sufficient space outside to park several cars. There is also outside lighting in the Garden and Pool. 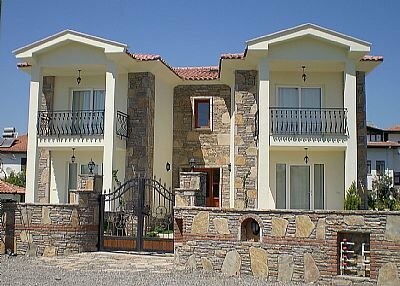 This Apartment is ideally situated for everything you could want to do in and around Dalyan. There are 2 Supermarkets within 5 Minutes walk - the centre of Dalyan with Bars, Restaurants and Shops is also within 5 Minutes walk. Views of a Storks Nest which is very close to Apartment. Mountain Views in every direction.